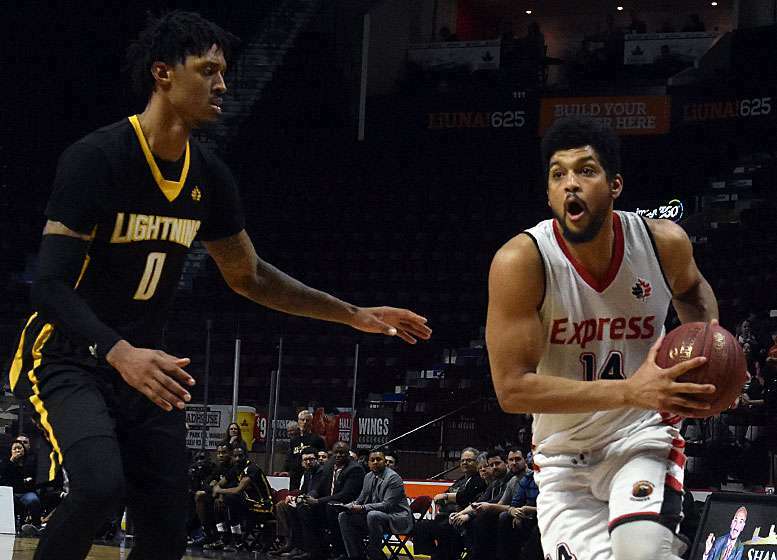 (WINDSOR, ON) – In their quest to better their post-season position, the Windsor Express first had to address a home date against the division leading London Lightning on Sunday. The match was the first of two in which Windsor needed to assert themselves if they wanted to move up in the standings. In the early going the Lightning defended aggressively as Windsor moved the ball around the key. When former Express player Ryan Anderson was assessed two quick fouls, the London bench was equally as quick to rise to complain. Anderson was denied on a trip up the floor when Kevin Loiselle placed himself in line with the net and took the charge and change of possession to the delight of the fans. By the end of the quarter, Windsor cut the London lead to 4 points, 20-16. Opening the 2nd period, Braylon Rayson pulled down a rebound and converted the fast break with a jumper from the paint. Sefton Barrett then dropped a jumper from the high post to settle Windsor on the right path. London’s head coach Keith Vassell appeared to have a breakdown as he berated the officials after the Lightning allowed the shot clock to run down. Doug Herring Jr was also seen discussing the issue with the referee as Frazier dropped two from the penalty stripe. London followed it up with a second shot clock violation moments later. The audience was brought further into the game as Royce White elbowed Windsor’s Omar Strong and sent his to the hardwood. Strong replied with two easy ones from the line. Harris added insult to injury with a drive for 2. Windsor still trailed by 5, however, with 4:00 to play. One person described the game as intense. London came back from the timeout with a vengeance, dropping three from outside to put some distance between them and the Express. The margin ballooned to 15 before Loiselle dropped 1-for-2 from the line as White again argued with the ref. Before the horn sounded to close the half, London managed to run the margin to 23 points as Windsor’s shooting dried up down the stretch. London led 61-38 at the break. Anderson led the Lightning with 14 points off the bench as Loiselle did the same for Windsor for 15 points. Anderson received some support from Herring Jr who put up 12. London’s shooting on the half reached the 50% mark while the Express couldn’t get under way, successful on only 28.6%. The Lightning pushed their lead during the 3rd quarter to 25 and Windsor couldn’t get any closer. The teams traded buckets throughout the period but the best Windsor could do was pull within 22 on a Mike Lucier triple. They finished the quarter with London leading 88-66. Loiselle finished with a game-high 25 points playing from the bench. Between Parker and Lucier, they were 3-for-6 from downtown. Both teams ran into foul trouble as the coaches had to manage no less than seven players who ended the game with 4 or more infraction calls. Two starters on each team combined for a total of 18 calls. The crowd never left Windsor, and were rewarded for their faithfulness with a Logan Stutz carry up court culminating with a two-handed slam. He then repeated the feat a minute later. Rayson followed Stutz with a triple from the top of the arc. Windsor trailed by 21. Still, the Express suffered too many trips into the London zone without securing any points. By comparison, the Lightning scored almost at will, though 20 points separate the teams with 7 minutes to play. With 5:04 on the clock, the Express whittled the London lead down to 16 after Rayson finished of an Anthony Ottley Jr rush to the rim. Despite the late push by Windsor, the Lightning held on for a 119-106 win to move 4 games up on the Express with three games remaining. Windsor will start the post-season on the road with only the destination, London or St John’s, to be determined. Windsor will finish the season on the road with games in London on Wednesday, St Catharines on Thursday, and Kitchener on Saturday. Game 1 of the playoffs will be April 8.